Do you know how tall you are? Two inches in one night! Anyway, Kidz Rule was the most fun part of the Art Fair but I also liked to see friends and I liked to sell my pot holders. 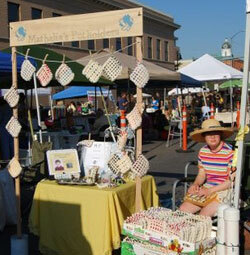 My mom was excited to see that lots of people liked my new products: my locker-hooking trivets and my woven rugs. My mom took pictures of my customers so that we can show my happy customers in my Senior Project Presentation. On Saturday we packed up the stuff and went home. Last year I only had 3 green pot holders to pack up but this year I had a lot more pot holders left over. Still it was fun. My mom was very tired and suggested that we skip the Symphony that evening. I said, `NO WAY!’ And it is a good thing that we went because they played The Nutcracker March and Three Moravian Carols which I know from Orchestra. During intermission they had a funny contest asking people to vote for the encore. I had some money in my purse so I could vote: I voted for Silent Night but The Hallelujah Chorus won. It was a wonderful evening and I am so glad that we went. It turned out to be just fine for my mom, too: she was wide awake the whole concert because she was sitting next to an annoying man who was drinking a bottle of wine and sharing it with his friends. . . . See it all worked out—we were able to fit everything into our weekend: the Art Fair and the Symphony! In the afternoon, we had a two-hour rehearsal for the Christmas Eve Service at church. Rehearsal went just fine but after that I wanted to go the Preschool Christmas Program. My mom had said, `No, We can’t go to the Preschool Christmas Program because we have to go home to rest and relax.’ Well, after the rehearsal—while she was cleaning up the snack— I went into the nave and sat with friends thinking that she would not find me and that I could just sneak the Preschool Program into our afternoon and she would never find out! Well, when she was ready to go, she couldn’t find me. Hah! She looked downstairs; she looked in the bathrooms; she looked in the car. Then she looked at the coat rack—-my coat was still there. Betrayed by a coat! `Ah Hah,’ she thought, `Mathalia wants to see the Preschool Program.’ And that is when she found me sitting in the nave with friends. 😦 I went with her but I didn’t want to go with her. I got in the car but I didn’t put my coat on until we were almost home because I was very disappointed: `Preschool Christmas Program can’t go.’ My mom said that maybe we could go next year. I will hold her to it!